From Goodreads: When Zachary Black discovers a door set between two giant cliffs, he realizes he has never seen anything so peculiar. Unable to resist the doorway, Zach opens it to find that he is looking into Endra. Have you ever had someone say to you that they have seen your double? Well, that is your ‘reflection’ from Endra who has sneaked through one of the doorways. Not usually a problem if they go back, but what if they decided to stay? What if they decided to change something? What if they were trying to kill the person you love? 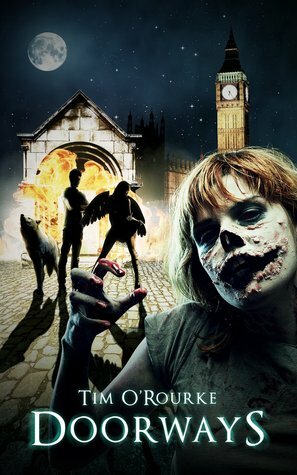 With the help of a beautiful Vampire named Neanna and a werewolf called William, Zachary’s journey takes him across the vast plains of Endra, through the streets of London and across the Atlantic Ocean as they pass back and forth through the doorways in a race against time. But the doorways have the power to change you – altering your appearance and abilities as you pass between the two worlds. This is a great novel for all ages, but especially MG and YA. I really enjoyed reading it and the idea of the alternate universe was original and refreshing. O’Rourke has created a unique, well-developed world, and the story pulled me in immediately as it drops right into the action. I thoroughly enjoyed O’Rourke’s explanations of the creatures on Endra and the many changes they undergo as they pass back and forth through the doorway between the worlds in hopes of saving the world as we know it. The characterization was superb, and I especially loved Zachary Black, Neanna, and William—their coming-of-age story and realizations along the way were witty and real, causing me to fall in love with them as they went along their journey. This novel has a little something for everyone, and I feel like this adventure story and the writing style are similar to that of Tolkien and Lemony Snicket. O’Rourke has a very vivid imagination and it shows through his storytelling, inviting the reader to join this epic journey between two worlds. I highly recommend it! Four stars.